Extracts micro-events recorded by a micro-seismic network. Composed of separate components that can be connected together (Modular Architecture): Parser, Band-Pass Filter, Picker, Classifier, Associator, Post Processor. The user can replace or add any component without affecting the rest of the system. Therefore, it can support many processing algorithms. Takes into account seismic network topology which is very important for precise detection. Can be applied to data being recorded by a group of stations. Trigger module. The trigger module applies the recursive STA/LTA algorithm on a file and detects triggers regardless if the trigger is generated by noise or seismic event. Classifier module. The Classifier module uses high order statistics to categorize the trigger as noise or seismic signal. Associator module. The Associator module compares the time stamp of the primary arrival of the seismic waves of all stations of the same station group according to the network topology. If the time difference is less than a value in a predefined number of stations, the triggered signal is identified as seismic event. Post Processor module. Gives the ability to the user, plotting the files with the selected events, to confirm that the triggered signals are related with seismic events. Possible false triggers can be rejected by the user. During the develop of the software, many seismic algorithms were tested for the detection of the arrival times of the events. When data are noisy, best results were obtained by applying the “recursive STA/LTA” which combines speed and reliability as it is a real-time sequential algorithm and its implementation is easy. However, the algorithm has one basic disadvantage when it has to be applied in random noise signals. The trigger threshold value is fixed so the algorithm will not be applicable in noisy data. This disadvantage has been eliminated with the use of variable threshold level (GEObit patent), which automatically is set from each file being processed. Thereby the sequential behavior of the algorithm recursive STA / LTA algorithm is maintained and it still remains real time. The raw data have to be organized in files named with the station number. Station numbers must start from 01 to 99. This dataset can be under any directory like “visits_9_10_11_12” or whatever. The output directory has to be initially created from the user, and it’s path has to be added to the appropriate field on the software form. The parameters of the ini.txt file have to be set by the user, and it’s path has to be added on the software form as well. Then just pressing the “Search” button, the software will do the seismic event detection, and select and copy all the files. Further data post processing will be applied by the user, using the “CleanUp” procedure. Plotting of the data will be done, in group of stations, like they have been processed. All the trigger points of the waveform will be grayed from the data plotter helping the user to confirm if the detected signal is a seismic event or a false event. Advanced Seismic Software Applications. Automated event detection & picking software. The software can be used for very small seismic events extraction from raw data, acquired for Passive / Active Seismic Tomography applications, hydraulic fracturing applications. Waveform display – Arrival time picking – Hypocenter location calculation. Process CORE24 files and several other data formats. Supports tools for filtering, FFT, integration / differentiation, convolution / deconvolution, response, spectra etc. 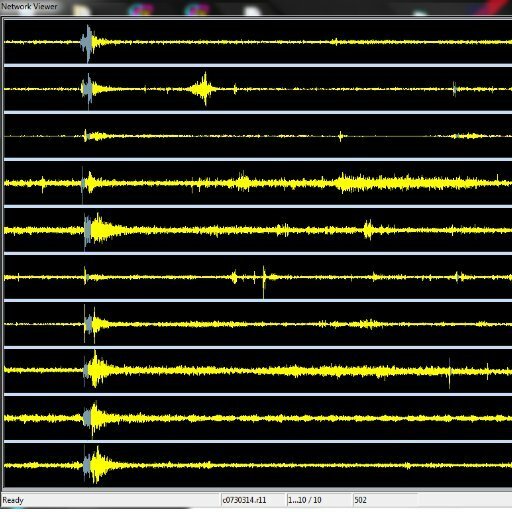 SeismPlus is a software package for interactive visualization and analysis of earthquake seismograms. 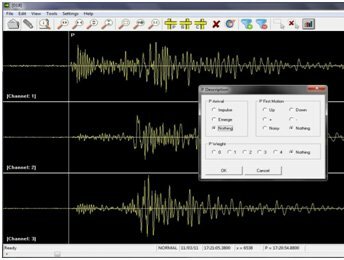 SeismPlus performs waveform display of one or more sets of single trace seismograms, automatic and manual arrival time picking, hypocenter location of local, regional and teleseismic events, magnitude determination as well as import/export of several waveform and phase data formats. SeismPluts acceps data at the next formats: CoRe24/32, Mini-SEED, or ASCII . The SeismPlus accepta also HYPO71 files. Processed waveforms are output in CoRe24, Mini-SEED or ASCII data format, while phases and locations are saved only in the HYPO71 format. Other formats are available upon request. 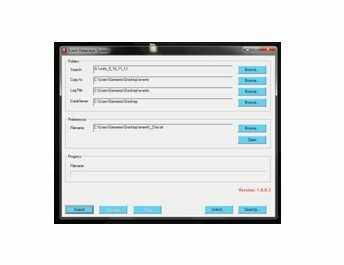 SeismPlus runs on any PC with Microsoft Windows 10/8/7/Vista/XP/2000 operating system.